The Biggest Loser: Canine: Mama Mia! Flippin' Pizza(s) for Shelter Pets! 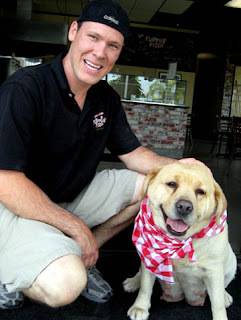 Jason Bennett, owner of Flippin' Pizza in Encinitas, has stepped up to the plate to find homes for the thousands of animals being surrendered at county shelters. Beginning today, he is offering 3 FREE cheese or 1-topping pizzas to Encinitas residents who adopt a shelter animal. What motivates Jason, who only bought the business a few months ago? "First, I love dogs," he said. "I read in the newspaper how many pets are being brought to the shelters because of the economy, and eventually euthanized because there are not enough homes. "I thought this would be a great incentive for people to adopt a shelter pet." To take advantage of the promotion, patrons must present a signed San Diego County - Animal Services Adoption Agreement dated June 24, 2009 or later along with a valid drivers license with a signature that matches the one on the contract. Offer is only available to Encinitas residents at the Encinitas store. "Flippin' Pizza is all about being part of the neighborhood," Jason said. "We want people to consider us their neighborhood pizzeria." * Offer expires 90 days after contract date. Tonight, Thursday, June 25, 2009, I ate at Flippin' Pizza on El Camino Real, it was phenominal, Great service, great atmosphere, terrific reastaurant, and the best damn pizza I've ever had. I've been in over fourteen different states, and am a pizza connoisseur, the food was amazing! Also, Jason, the owner is a great guy. If you want more info on the details of the pizza, just blog it. I love Flippin' Pizza. New York pizza done better than in New York! Love the picture of the adorable dog. Jason's scarf is so cute!